Hi everyone – This weeks update is all about Junior Presentation Day and Finals!! At 6.00pm we will be having pizzas and sausages. It would be great for as many families as possible to stay during this time. At 6.45pm we have the important Dave Cowell Award – where a Junior Player is acknowledged for their efforts, commitment and endeavours – on and off the field. There will be a raffle over the evening. Tickets will be 1 for $2, 3 for $5 or 7 for $10. Prizes include Melbourne Stars and Melbourne Renegades signed Cricket bat, Batting helmet, meat trays and Piccolino’s vouchers. U18 Semi Final – Last Friday, our young men put up a great effort chasing Croydon Ranges score of 380. After our 50 overs, we were 215 – falling short of the target. Special mention to Captain Josh Richardson, who opened the batting and made 84. We look forward to hearing more from Buddy on Friday night regarding the season. Well done boys – everyone is very proud of your efforts this season. U16 Semi Final – Also last Friday night at Mahoneys Reserve, our U16 boys were defending a solid score of 162. Our young men bowled Park Orchards out for 124 in a complete Team effort. The emphasis on team was truly on display, when Athos Petrou took an amazing catch when the ball was ‘smashed’ to him at mid on, and also Ryan Mackie was brilliant in the field, completing a run out with a very quick pick up and strong throw. U16 Grand Final – The win against Park Orchards put the boys into the Grand Final against the undefeated Glen Waverley. The first nights play was last night and Glen Waverley batted first making 7/269 – a very good score. Day two will occur tomorrow night (Friday) at Capital Reserve in Glen Waverley. 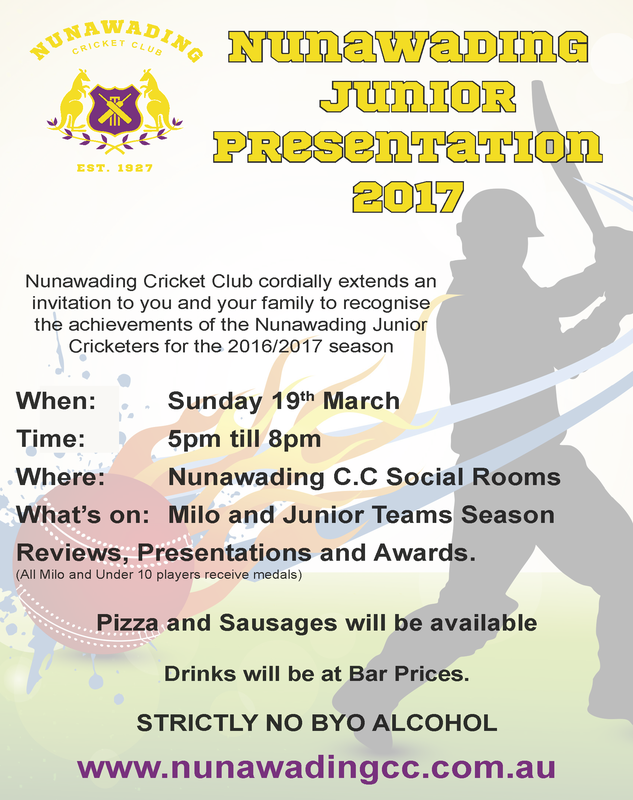 If you can attend it would be great to see heaps of Nuna support for our boys, as they try and chase down a Grand Final win. As mentioned last week, our 5ths team was playing in the Semi Final. After setting a score of 170 (special mention to Glen Mackie 43, and Zach Scully 40 – coming in at number three and batting very determinedly most of the innings), Nuna bowled Kerrimuir out for 82.Pat West was brilliant with the ball taking 6/17, and Flynn Maguire bowling fast picking up 2/14. Special mention to Jean-Paul who not only captained the team, but took 6 catches wicket keeping. This puts the team into the Grand Final this weekend, playing Saturday and Sunday (starting 1.30pm both days) at Bob Saker Oval, Mahoneys Reserve. Please again come down and support (the support last week was fantastic). On Sunday, the game should be close to wrapping up just as the Junior Presentation starts, so to all our Junior families, please feel free to come down a bit earlier, grab a sausage and see some of our U16 and U18 Juniors, play with some older Junior Dads! !